There is nothing more fun than a long bus ride, lodging 4-to-a-room in a cheap motel, attending a top-notch track meet, and then repeating the long bus ride home. I’m serious. I love it. I’ve been doing it since March of 1996. Taking a “track trip” is the best team-building activity I know. The most important attribute of a great track team is talent. Most Plainfield freshmen think that track is what they experienced in middle school (depressing). 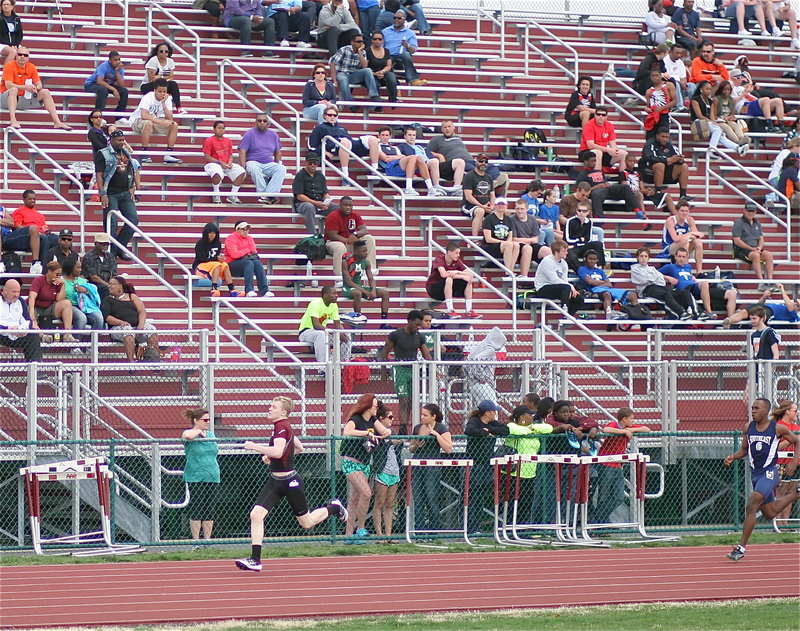 Tim Donahue ran his first outdoor meet at the best invitational in the state (Belleville West). Tim won his heat of the 400. Trips are “the buzz” about your program. Memories will be made. Stories will be told and retold. Some stories will take on a life of their own. It was 15 years ago, but I’m still reminded of the time I locked my keys in our 12-seat van at a gas station in Indiana. I had to call a locksmith. My guys never let me forget it. On another return trip from Bloomington, Indiana (Midwest Invitational), I took wrong turn and ended up in Louisville, Kentucky. We got home late that night. My Harrisburg athletes remember the tradition of stopping at Fuddruckers in Matteson on the way home from Glenbard West. Everyone ordered the one-pound burger. I will never forget a team meal at Ryan’s Buffet. Somebody told a waitress that it was my birthday when it wasn’t. I had to hold balloons while employees sang to me. I’ve always been embarrassed to have people sing Happy Birthday to me, but I will never forget that one. I’m reminded of the time our 12-seater van broke down. I don’t think those vans are legal for schools anymore. Everyone uses minibuses now. Anyway, Harrisburg’s minivans were old and had been driven hard. We were taking a trip to Glenbard West (340 miles) and we were a couple hours into our trip. I smelled something burning and realized my gym bag between the two front seats was beginning to melt. Try finding a mechanic in Effingham at 5:30 on a Friday night using payphones (before the age of cell phones). I miraculously found a mechanic. He fixed something under the van by pounding it with a large hammer. I’m not making this up. We arrived at the Hampton Inn around midnight. I ate leftover Giardanos pizza for the first time in my life. We ran like champs the next day. Giardanos will always be my favorite pizza. 2007 was my first year at Plainfield North. I talked Athletic Director Jeff Johnson into allowing us to attend the SIU Indoor. I talked SIU’s Matt Sparks into allowing us to enter two teams, PN-Varsity and PN-JV. We took a school bus. As luck would have it, I got the flu and ached all over. I’ve never missed a practice, game, or meet due sickness in 33 years of coaching. Riding on a yellow school bus seven hours was a torture test. Our school bus had a “governor” that kept our max speed at 55 mph. We were passed by a minimum of 10,000 vehicles. The meet lasted forever, over eight hours. Then we got back on the bus. 55 mph for seven hours. 10,000 cars passed us. We got home after midnight. The kids thought it was the greatest weekend ever. 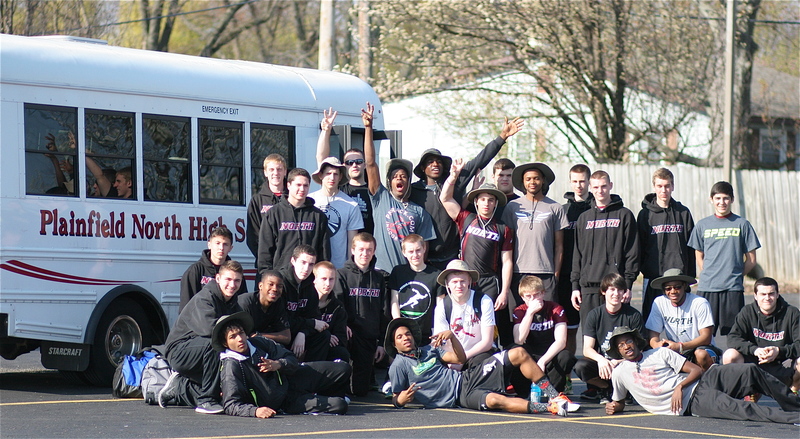 I will never forget when Andrew Schmidt brought his track team to Harrisburg for a meet in late March, 2004. Bloom arrived at Taylor Field in Harrisburg at 9:00 PM on a Friday night. Think of that for a minute. Chicago Heights Bloom travels to Harrisburg. Harrisburg, an old coal mining town, is located 20 miles from Kentucky. I used to call Harrisburg “The Land That Time Forgot”. Andrew’s kids got out of their station wagons. When they’d left Chicago, temperatures were in the 40s. The temperature at 9:00 in Harrisburg was 70. I met them at the track and flipped the lights on. 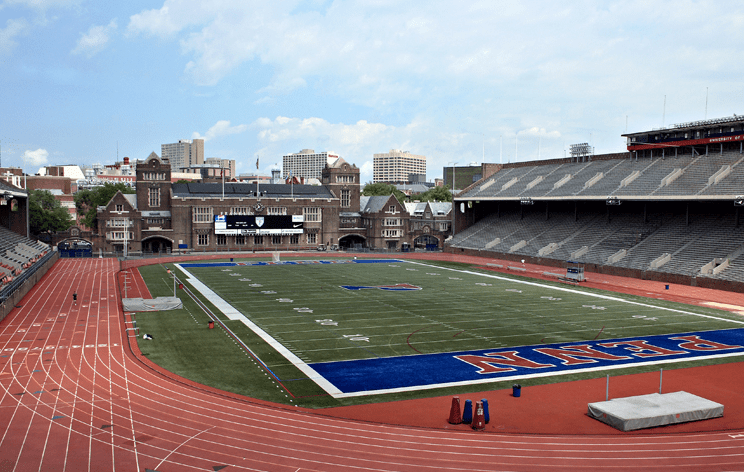 In Harrisburg we kept our football field and track open to the public 24/7. At Plainfield North we keep it locked up like Fort Knox. Bloom’s athletes were like kids on vacation. They hurdled and jumped and sprinted for 45 minutes. The next day we had a track meet. Cross Country coaches have known about the team-building aspect of trips for a long time. Some cross country teams go camping. Some teams go on canoe trips. Some teams travel to Colorado and train at altitude. The trip makes memories. Friendships are created. Tolerance is learned. Education isn’t exclusive to the classroom. Sports take up about 1% of the total education budget. Sports are the best bargain in public education. Yes, the “ball sports” are over-exposed, but don’t throw the baby out with the bathwater. 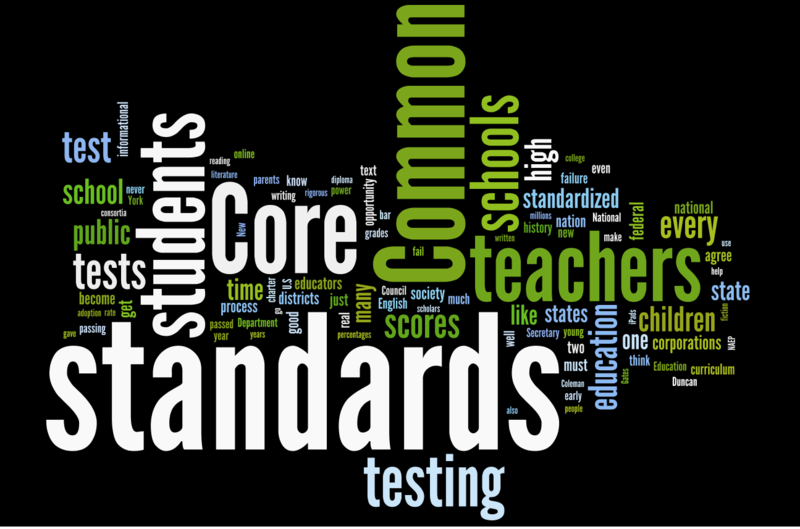 Wordle of the top 100 words in a recent education article. Words mentioned most often are biggest. No mention of co-curricular activities, athletics, or sports. 90% of my high school memories were experienced outside the classroom. Tell that to those uptight academic types who obsess over curriculum and standardized assessment. Despite the haters, extra-curricular (co-curricular) activities remain an important component of the high school experience. Going on a track trip might improve your chances at the state meet. 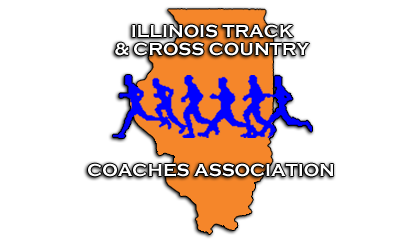 The IHSA State Meet is a road trip. Athletes must eat and sleep away from home for three days. They must compete at their highest level without sleeping in their own bed. How do you get good at this? Practice. How can you incorporate a road trip into next year’s schedule? How do you finance the trip? What do you need to know? First you must sell it to your athletic director. Some athletic directors think they are paid to say “no”. The baseball team plays twice as many games as we have meets. Baseball also plays freshman and sophomore schedules. Track teams have one or two home meets and have a total of only 18 dates. Can’t we can go on ONE road trip? Our varsity runs in meets 18 times, including indoor, outdoor, sectional, and state. We see Plainfield South eight times. Isn’t that enough? Some programs see local schools at every meet. How would you like to get beat by the same kid from the same school at every meet? Get out of the neighborhood! 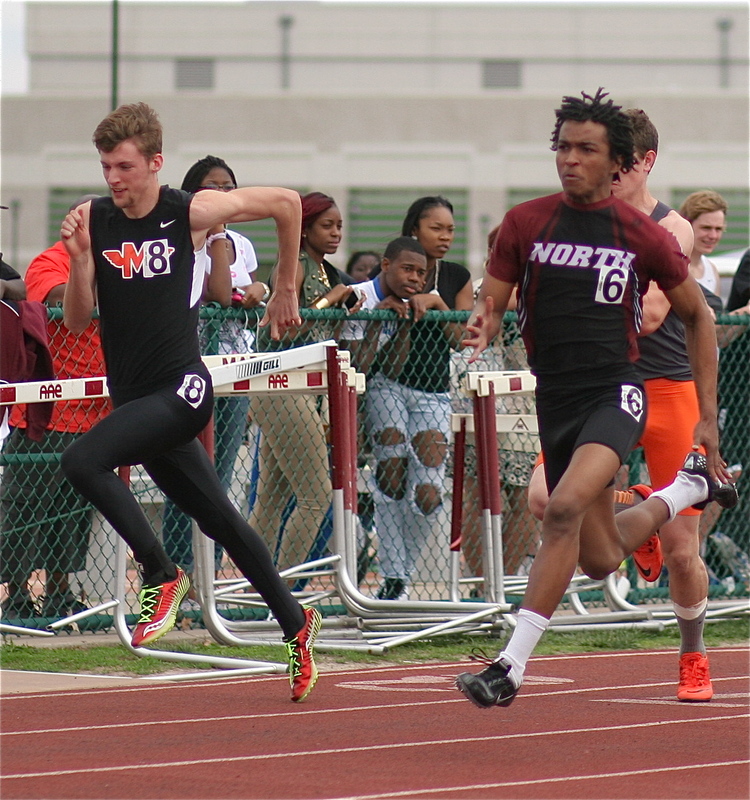 Instead of running every meet against South, Central, and East, Annile Williams has made friends with two of the best hurdlers in the state, Craig James and Isaiah Michl of Edwardsville. Don’t be afraid to ask the host school to waive your entry fee. I waived all entry fees for teams who agreed to travel to Harrisburg. Host schools are crazy not to encourage far-away-teams to come to their invitationals. Negotiate travel cost. East St. Louis still travels on charter buses for their road trips. Some schools will fund a trip through booster club money. Some schools will allow trips as long as the coaches do the driving. At Plainfield North, we drive the buses and we pay for our own gas. The gas money comes from our Fast Cat Race. In the parking lot of the Quality Inn, O’Fallon. 28 guys are posing with one of the minibuses. Note the hats purchased from the Wal Mart across the street. My athletes bring $20 cash with them. We collect the cash at the hotel. I pay for anyone who doesn’t have money. I’ve never left a kid at home who didn’t have $20. 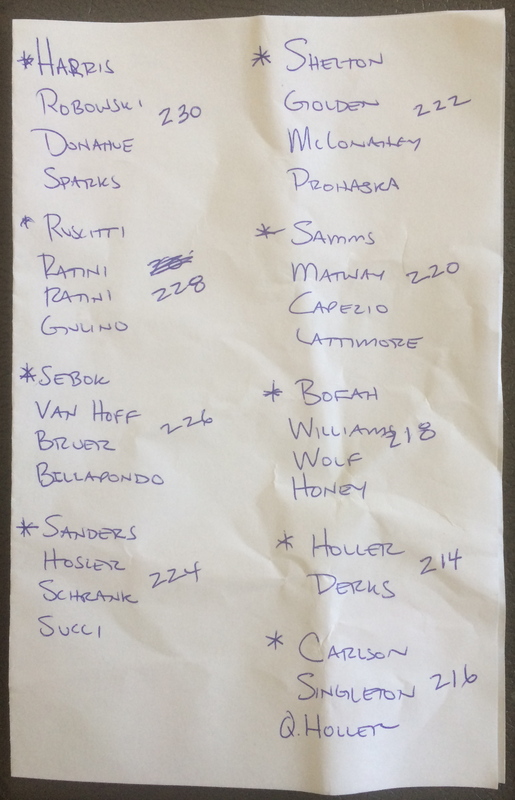 Our room list from April 14th written up by Coach Carlson. Room captains are noted. The hotel is given a copy and we keep a copy. If something gets broken we have record of who stayed where. I allow kids to pick their roommates but I discourage segregation by age, skin color, event, etc. Every room must have a legit “room captain”. The room captain is 100% responsible for his room. He reports problems. If someone gets in trouble, the captain is in trouble too. But here is the deal, no one gets in trouble. I treat my kids with respect. I trust them. I don’t do room checks. I don’t tape their doors at night. If you treat kids as criminals they will act like criminals. I’m honest with my team. I tell the story of my third state track meet in 1984. After our kids failed to qualify (AA) in the morning I went into one of their dorm rooms. To this day, I don’t know why, but I picked up a plastic cup and smelled it. I recognized the smell immediately. Our high jumper had brought a bottle of Jim Beam on the trip. His senior year was behind him so he intended to have a party. I tell my athletes the story because that kid embarrassed himself, his family, his team, his school, and his town. He also endangered the job security of his coach. His consequences were severe. Since then, the worst thing that’s happened on a trip was a missing pillow. The hotel charged me $20. Athletes are responsible for their own food. They can bring food or bring money or both. Some kids order a pizza. Others walk next door for fast food. Breakfast is always provided by the hotel. The meet provides concessions. Sometimes we stop on the way home but sometimes we drive straight through. Basically, the weekend will cost each kid about $50 total to pay for the hotel and pay for all food. If you don’t have $50, you better bring food. I tell the team to be on the lookout for guys who don’t seem to be eating. I’ve handed out several $20s over the years. No one goes hungry on my team. The key is to keep it easy and simple. The coach doesn’t have to do everything for his team. Teach. We meet before going to rooms. We discuss conduct. Wrestling in rooms must be addressed. No “horse-play” in the swimming pool. Don’t even consider stealing anything, ever. If you’re eating at a restaurant, be the quietest people in the place. Note – I once sent Kapri Bibbs (RB, Washington Redskins) to the bus for giggling at a restaurant, “But coach! I haven’t eaten my food yet!” Lessons learned. Curfews are important. I set an in-the-hotel curfew, an in-your-room curfew, and a lights-off curfew. At our last trip, the curfews were 8:30, 10:30, and 11:30. We had a team meeting at 9:15 am and our meet started at 11 am. I also set the time for the morning meeting. I refuse to do wake-up calls. I expect every guy to have eaten, showered, and have bags packed by the time the meeting starts the next morning. At The Character Games in Atlanta back in 2007, I had a freshmen sprint relay team show up 10 minutes late for the morning meeting. They were suspended from competition that day. They served as sacrificial lambs. From that moment on, no Franklin Rebel was ever late for a meeting. No one ever broke curfew. It has been my experience that kids usually don’t perform well after long bus rides and staying overnight in a hotel. However, the process of competing away from home is important to a kid’s growth and maturity. I tell my guys the truth, “don’t expect great performances”. Maybe there’s an element of reverse-psychology in my approach. 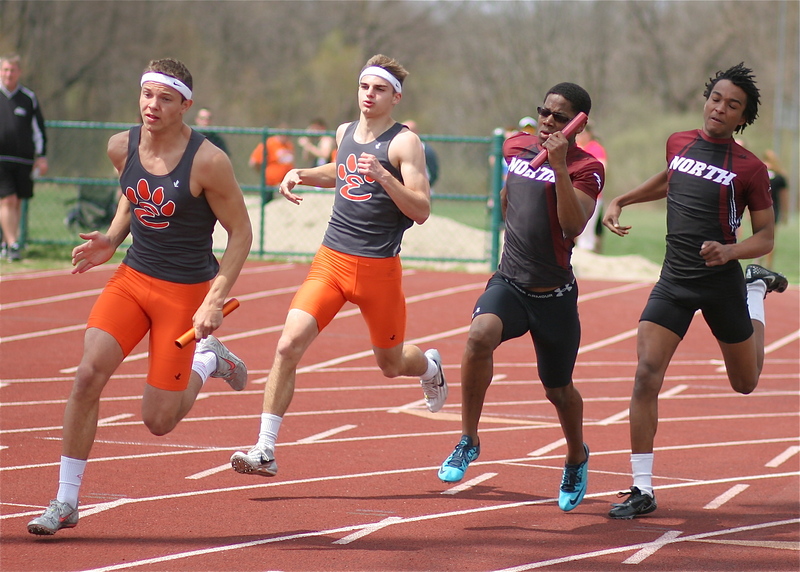 At Belleville West we set three school records. In addition, I’ve never had a team run a faster 4×1 in April (42.56). Not only did we make a 266 mile trip and sleep four to a room, this meet was our first outdoor meet of the year. We had not competed for 14 days. The weather had not been great for training over those two weeks (understatement). Sophomore DeVaughn Hrobowski placed 3rd in the 100 from the slow heat. I’ve never had a sophomore run a faster FAT time (11.01). Pretty cool that Minooka made the same road trip. 42.56 is April-fast, especially for three juniors and a sophomore. 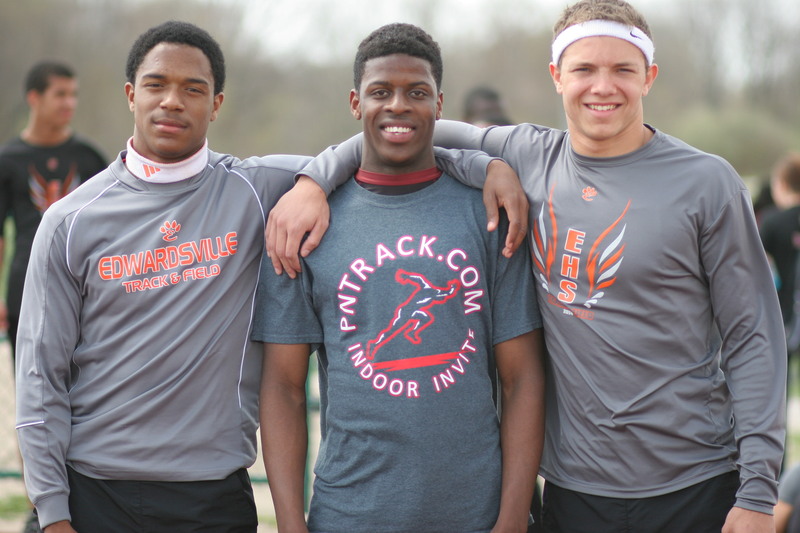 Edwardsville ran 42.09. Track & Field has numerous pitfalls. The meets are long and boring. Springtime in Illinois is cold, windy, and wet. Many parents treat track & field as a “recreational activity”. 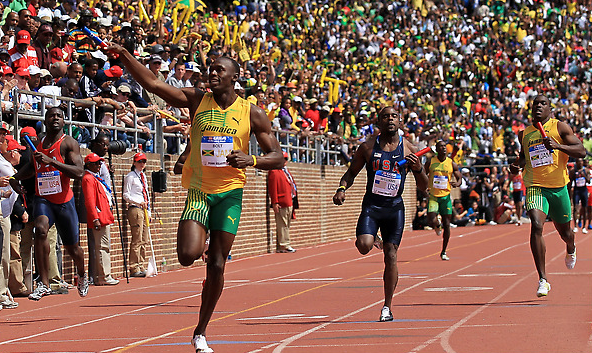 The U.S. is so over-the-top obsessed with football, basketball, & baseball, track & field seems left out. As coaches, we must do what we can to promote our sport and create memorable experiences for our track athletes. I spend more time with photography and twitter and pntrack.com than I do coaching my team. This weekend we head to Edwardsville for the Winston Brown Invitational. We are staying at the swanky Super 8 in Troy, IL. Edwardsville will be missing their head coach, Chad Lakatos. In Chad’s absence, Alec Holler will be the meet manager. Chad is missing the Winston Brown Invitational because he is taking five sprinters on a road trip, the coolest road trip ever. Hampton Inn Philadelphia Center City Convention Center – 1301 Race St.
Good luck to Edwardsville this weekend. Make memories, make friends, and compete like crazy. Let’s go on a road trip!